Netanyahu’s Speech to Congress – Excellent! I thought his speech was brilliant and I’m embarrassed that our president and so many of our leaders refused to attend. They’re acting like spoiled brats. Here you see a real world leader — I wish we had one. Here is the link to listen and watch if you missed it earlier today. The book, which consists of essays by five Cardinals—including Cardinals Burke and Brandmüller—and four other scholars, was written in response to Cardinal Walter Kasper’s book The Gospel of the Family, and defends the Church’s teaching that Catholics who have been divorced and civilly remarried cannot receive Holy Communion. It was edited by Fr. 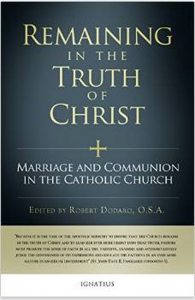 Robert Dodaro, OSA, who was interviewed about it by CWR last September. 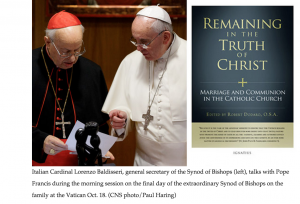 Kath.net reports that around 200 copies of the book were mailed, but only a few apparently made it into the hands of the proper recipients, a report that has also been confirmed by Fr. Joseph Fessio, SJ, of Ignatius Press. Pentin states that the books were mailed through “the proper channels within the Italian and Vatican postal systems”, but that Baldisseri claimed they were mailed “irregularly,” and so the interception of the books was legitimate. To read the whole disturbing article, click here. Rob Kaczmark and his new wife Kimberly joined us in the Holy Land last September. They own Spirit Juice Studios which is a new and talented production company. While they were with us they took magnificent and artistic pictures along the way. Never have I seen such eye-popping images of the Holy Land. Enjoy! Join us on a pilgrimage to Israel (it is very safe regardless what you see on CNN), Poland, St. Paul Mediterranean Cruise, Guadalupe (brochure coming soon for Dec 2016), Fatima, Avila and Lourdes, the Holy Shroud of Turin and a detailed tour all the way to Rome, and much more. Visit www.FootprintsOfGod.com.